Last night I let Caroline try on the dress that I wanted her to wear today. It has no pink on it so I needed to make sure she was OK with blue before this morning. She loved it because it twirled well! Yay! I tried really hard to get some good pictures of her, but this was the best I could do. 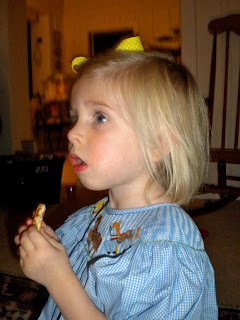 Thankfully, she managed to not get any of her dinner on her dress. She did not want to take it off to put pajamas on so I had to wait until she fell asleep to get her jammies on her. No complaints...I am just glad that she liked it and felt like a princess in a dress without pink!